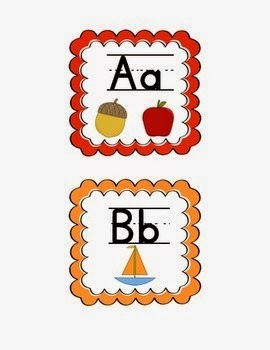 Learning about letters, sounds, and words is important to developing young readers and writers. Through games, finger-plays and songs, and other playful experiences with letters, young children develop a strong foundation in literacy learning. Learning a letter is not a simple matter of saying the letter name and singing the alphabet song. Rather early childhood teachers must support literacy development through a wide variety of authentic literacy experiences in their classrooms. For example, they can add images and print to a letter wall based on classroom explorations and curriculum themes, make use of environmental print, and show children letters in meaningful places throughout the classroom everyday. Systematic instruction in letter learning means planning short lessons throughout the day that show children how to look at letters, learn their names, and, over time, connect letters to the sounds in words. Create am interactive letter wall using two long pocket charts. Every word on the letter wall should have a picture to go with it. In my district, we suggest that only their names and pictures go on the letter wall the first six weeks. We suggest adding vocabulary words related to the month, the theme, and books you are reading beginning the second six weeks. This example came from a model classroom in my district. 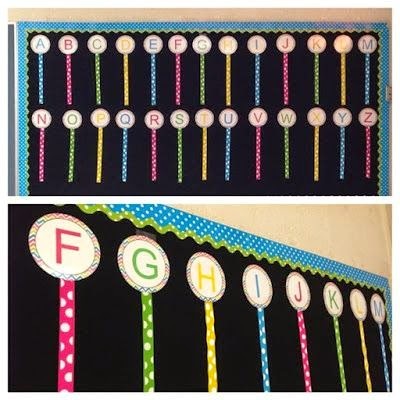 Create am interactive letter wall by sectioning off a large sheet of bulletin board paper using colored tape. After laminating the sectioned off paper, add small pieces of sticky-back velcro to make the wall interactive. This example came from a PK classroom in my district. 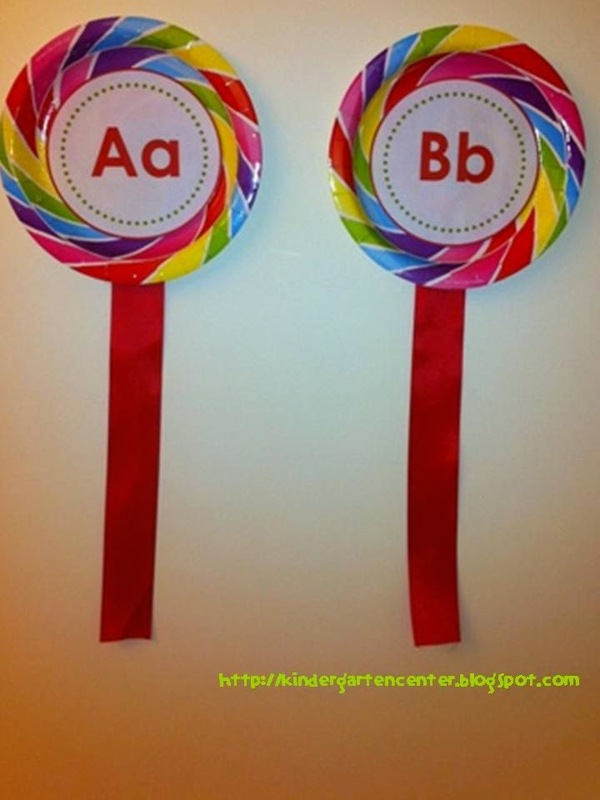 Create an interactive letter wall using paper plates and ribbon. Students use clothes pins to attach the word cards to the ribbon. This example came fromThe Kindergarten Center: Sweet Spots of Teaching Kindergarten. This example came from Simply the Middle. 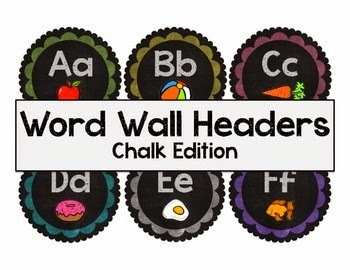 Create an interactive letter wall using a large magnetic oil pan or magnetic paint. This example came from KinderTastic. 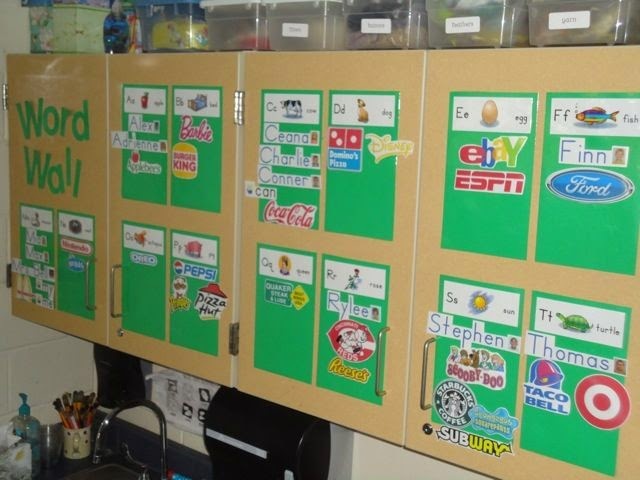 No matter how you decide to create your interactive letter wall, there is one key step to making it truly interactive. IT HAS TO BE LOW TO THE GROUND AND EYE LEVEL FOR THE STUDENTS. 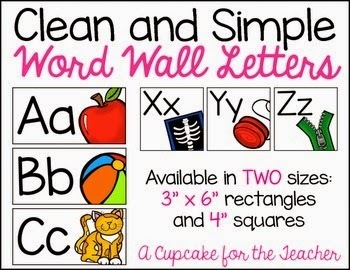 YOUR LITTLE ONES HAVE TO BE ABLE TO REACH ALL OF THE WORDS ON THE LETTER WALL TO TRULY MAKE IT INTERACTIVE. Letter walls should be displayed near your carpet/whole group area. The letter wall needs to be easily seen and accessed in order for you to be able to use it as an instructional tool. Letter walls can be used to provide young children with tactile experiences with letters. letters that have holes and letters that don't, letters that have straight lines and letters that don't, etc. 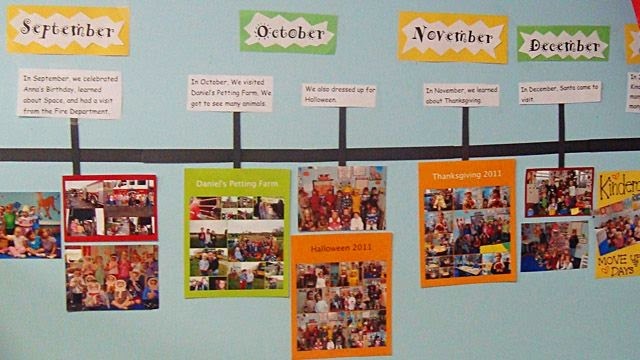 Here is an example of a letter/picture sort. You can download it for free here. 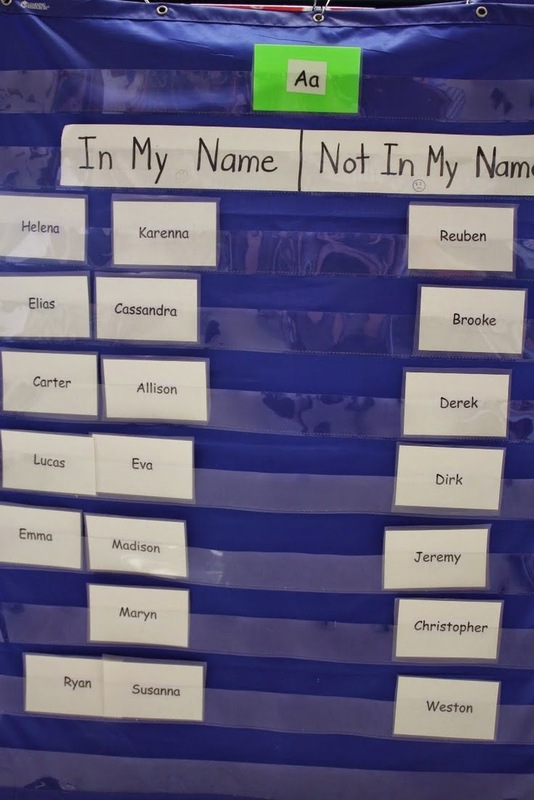 Students can use special pointers to do this, take turns by handing off the pointer to each other, or take letters up and add them to the wall as they name them. have in them. This example came from Mrs. Bremer's Class: Sharing Ideas for Your Classroom. 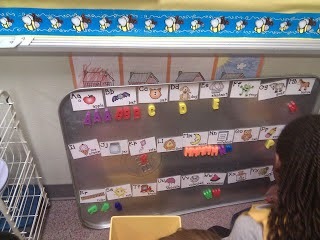 Students can also use an interactive letter wall when they are working in centers. They can remove letter and word cards from the wall and use them as a reference when making letters and words using play doh, making names using tactile materials, for letter sorts and matching, and for writing. 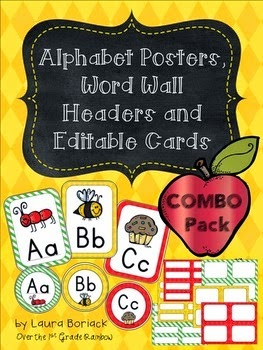 **You will have to model and teach students how to remove letter and word picture cards from the letter wall, use them in their center, and return them to the proper place on the letter wall. This will take lots of modeling and practice. Eventually, students will be able to do this with ease. Word learning, too, can happen naturally while children are expanding language through learning letters. Young children should not work on words in isolation before kindergarten because it is a meaningless task. 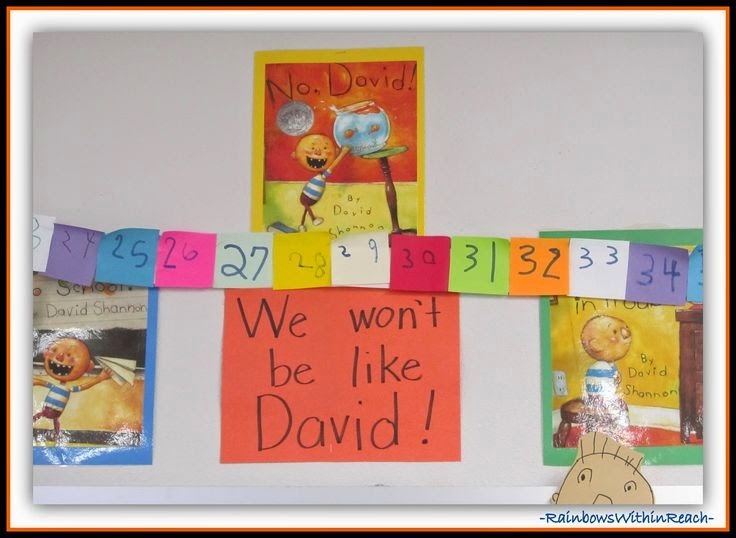 Prekindergartners will often begin to notice words in their environment. 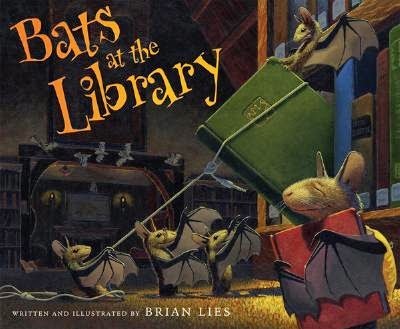 For example, young children are naturally curious about print in their environment and love to "read" it. Often, you will find they do not recognize the word or letter out of the context in which they usually see it. Nevertheless, they are noticing print. 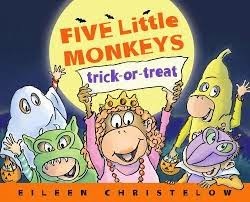 2) tell children to look at the beginning of the word, show them what that means, find words that start with the same letter, etc. Letter walls can also be used for posting environmental print- words from cereal boxes, etc. that children bring into the classroom. This example came from A Place Called Kindergarten. Here are a few letter wall headers I found on Teachers Pay Teachers. I like these examples because they have the picture to go with each letter. Using letter wall headers that contain pictures will help you when assisting your slower learners in finding words and letters on the wall. The pictures can be used as helpful clues. 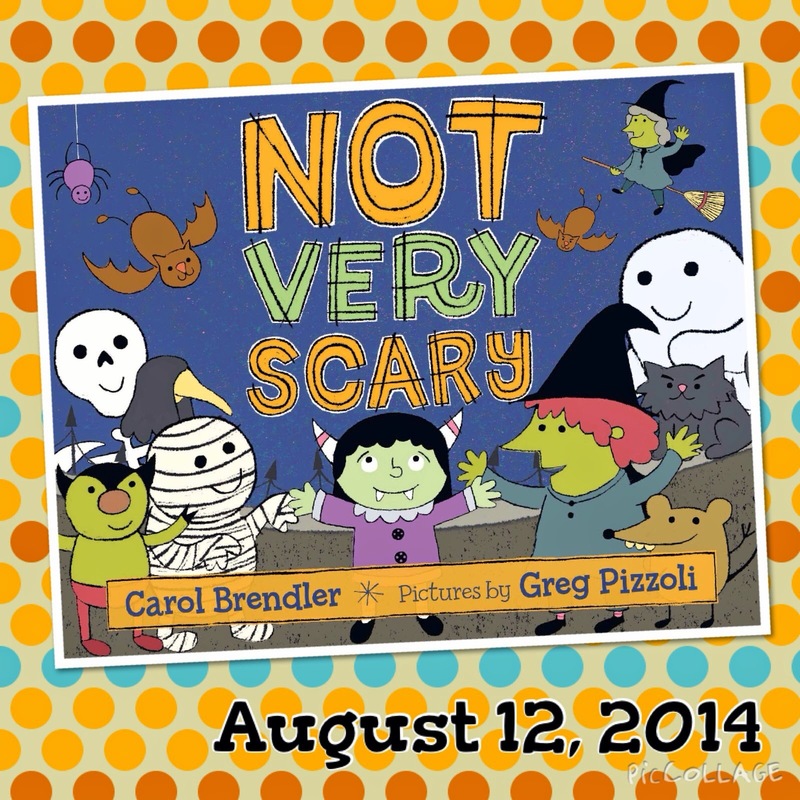 KidsParkz has vocabulary picture cards you can print for free here. Vocabulary picture cards do not stay up for the entire school year like words on a word wall. These words change with each theme and/or season, holiday, or unit of study. 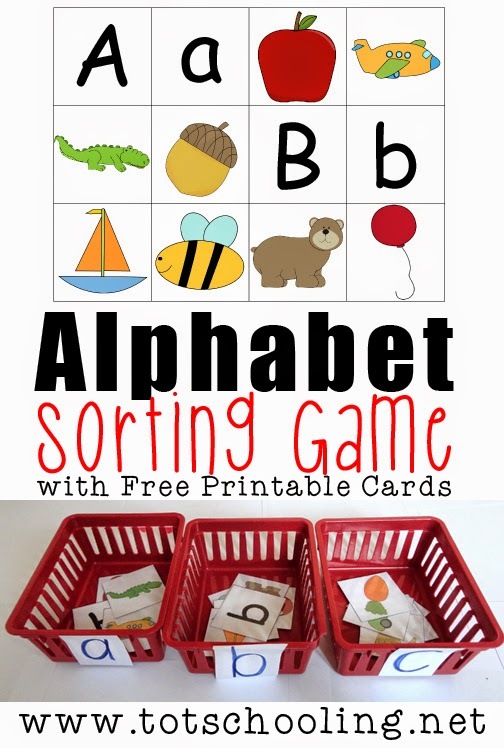 Check out my ABC Activities Pinterest board here and my Letter Walls board here. I recently read an article about calendar time for young children. It was first published in the May 2008 issue of Young Child (an NAEYC publication). You can read the article in its entirety here. The article made me think of my own calendar experiences and how maybe it was time to rethink some of the calendar routines that I had used for so many years. Calendar time/math circle time on the carpet can be a very important part of your day or it can be a dreary and difficult time to manage. It all depends on what you do and how you do it. Keep it short and keep children moving. Calendar routines and math circle combined should take no longer than 15-20 minutes. Offer plenty of opportunities for action and involvement- songs, fingerplays, and hands-on opportunities are just a few ways to keep children moving. 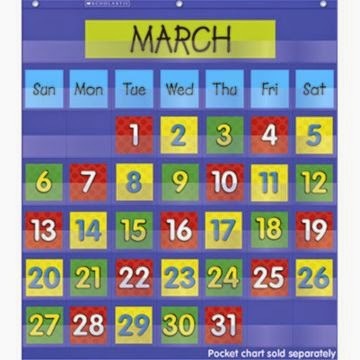 According to Friedman (2000), when looking at the development of young children there is little evidence that calendar activities which mark extended periods of time (for example: a month or a week) are meaningful for children below first grade. Friedman (2000) also noted that the ability to judge time from a past event or until a future event in terms of the calendar year is not in place until sometime between the age of 7 and 10. 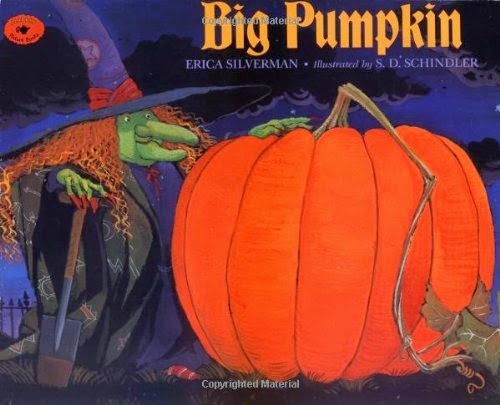 I know from personal experience that many of my kindergartners had trouble conceptualizing yesterday, today, and tomorrow and what day of the week or month of the year it was. What Should we Teach Using the Calendar? If Anything at all? So then... with this information in mind what concepts should we teach using the calendar. Numeracy, vocabulary, patterning, or sequencing?? Young children need opportunities to explore and and experiment individually with math concepts, using concrete materials and with a teacher who can respond to their questions and guide their learning. For example, a teacher can help children notice patterns in the environment and on the calendar, while also modeling and thinking out loud while making patterns with children in small groups. Oftentimes, teachers use calendar time to teach unrelated skills to math, such as colors, letters, emergent writing, and social skills. While each of these skills is important for young children to learn, the calendar may not be the best place to teach these. Teaching these skills at calendar make the time on the carpet lengthy and whole group time does not allow for individualized instruction. Although young children have difficulty judging the length of time between events, they can understand sequence of events. 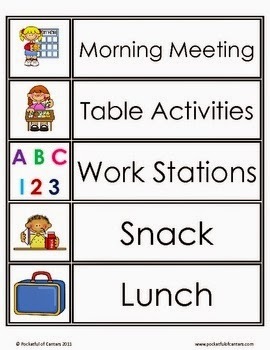 A pocket chart or poster illustrating the day's schedule in sequence can be helpful and meaningful to young children. Here is an example from a classroom in my district. This teacher used real photographs. The example came from Rainbows Within Reach. You can use real photographs you take of the students during the daily activities. Here is an example of daily picture cards using clip art. I found these from Pocketful of Centers on Teachers Pay Teachers. 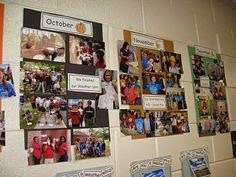 Post or display photographs of classroom events, projects, field trips, etc. Display them in a designated place to clearly reflect the sequence of events. As you add new pictures of events with the students, you can revisit and discuss past events with them. You can encourage students to tell their peers and other adults the story of the events, this will strengthen their understanding of how events unfold and build up their oral language skills. 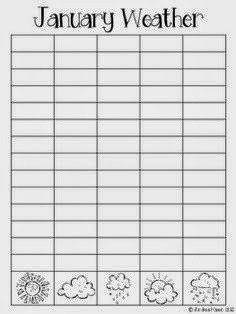 This same idea can be used with classroom journals. Students can draw pictures and dictate sentences about class events. Then they can tell others about what happened during the activity. Here is an example from Science Notebooking. This example is from Paper Zip. Linear representations can help young children begin to understand and conceptualize that a day is a unit of time and talk about it with increasing clarity. A good example is counting the number of days you have been in school by adding a link to a paper chain each day, a number pattern of colored post-it notes placed in a line across the wall, or adding a unifix cube to a stack of cubes (I did this in sticks of 10). This picture came from Rainbows Within Reach. 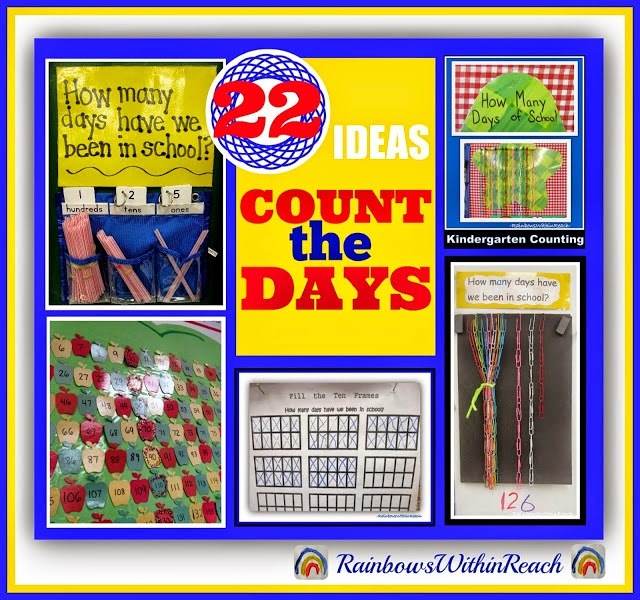 Check out the great post Debbie made about different ways to count the days in school here. 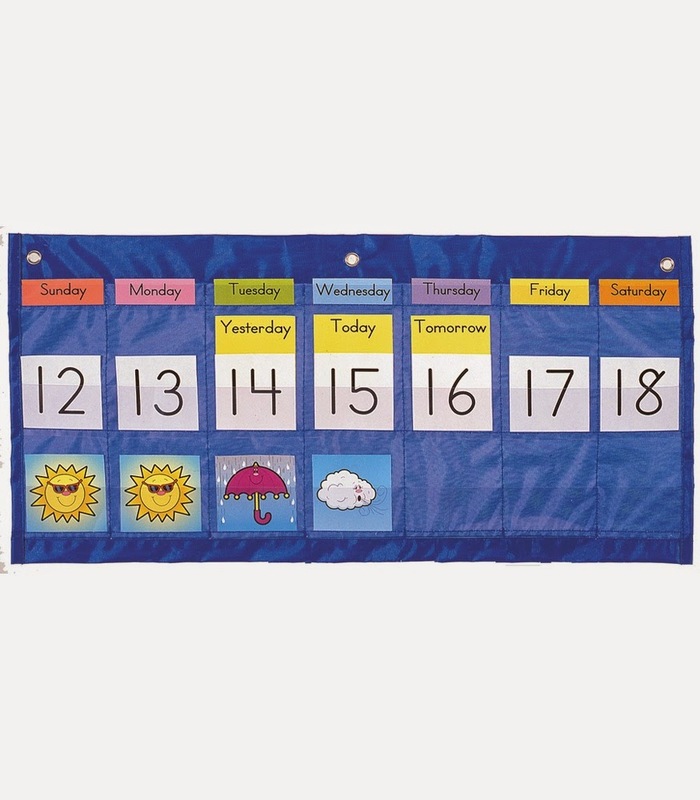 Young children can observe, record, and predict daily weather changes. The teacher can lead discussions on the weather and changes in the weather such as what to wear when the weather changes. 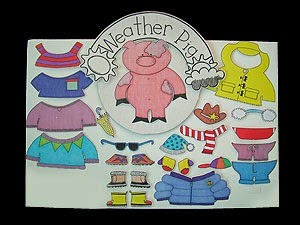 In my classroom, I used this weather pig from Poco and Pop. We charted the weather various ways over the years. Here are a few examples of things I have used. I used weather graphs similar to this one. I found this example from Andrea Mason on TPT. You can check it out here. Some younger or less mature preschoolers are not ready for whole-group activities. If you insist that they join the class on the carpet, they are likely to disrupt the activities you have planned and diminish the quality of calendar/math circle time for the whole group. Providing an alternative to circle time for those children may be in everyone's best interest. You may choose to let the child look at a book or work with play-doh in another part of the room. By making calendar/math circle time active, engaging, and enjoyable for the other children, not-yet-ready children will eventually want and be ready to join in. Classroom management is the key to being an effective teacher, to achieving student success, and to setting up a productive and efficient classroom environment. While there are a number of practices that work together to create a strong classroom management foundation, there are a few fundamental basics. Teacher preparation and organization, engaging lessons, building relationships, well-established routines and procedures for the students, and brain breaks or other related movement instructional strategies. According to Robert Marzano, classroom organization is one of the 11 factors that influence student achievement. 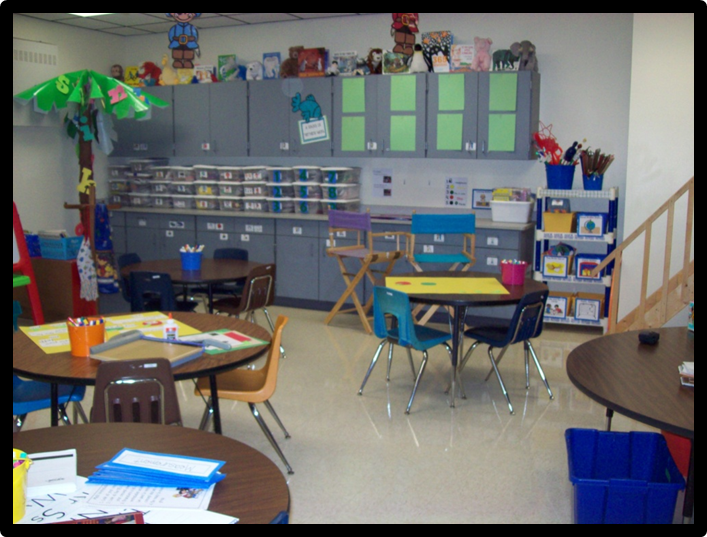 By being organized and prepared, teachers maximize instructional time, minimize the frequency of behavior problems and chaos, and create a safe and positive classroom environment. 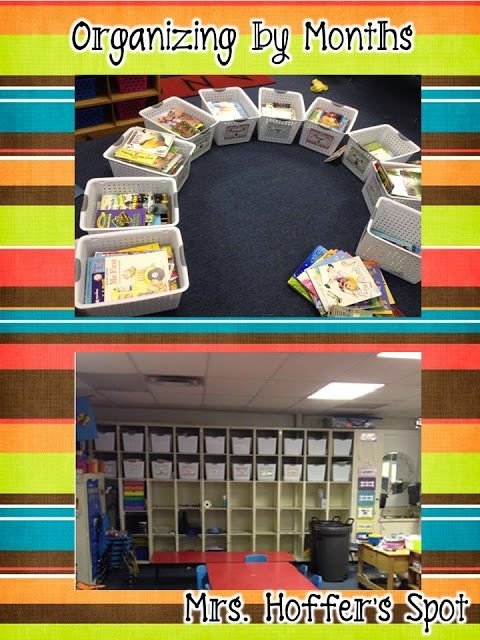 Organize your books and materials by month or theme. You are more likely to put your materials away and in a place where you can find them if you have them organized by a specific category. Being well-organized cuts down on lesson prep time as well. You can quickly and easily find the materials you need when getting your lessons ready. 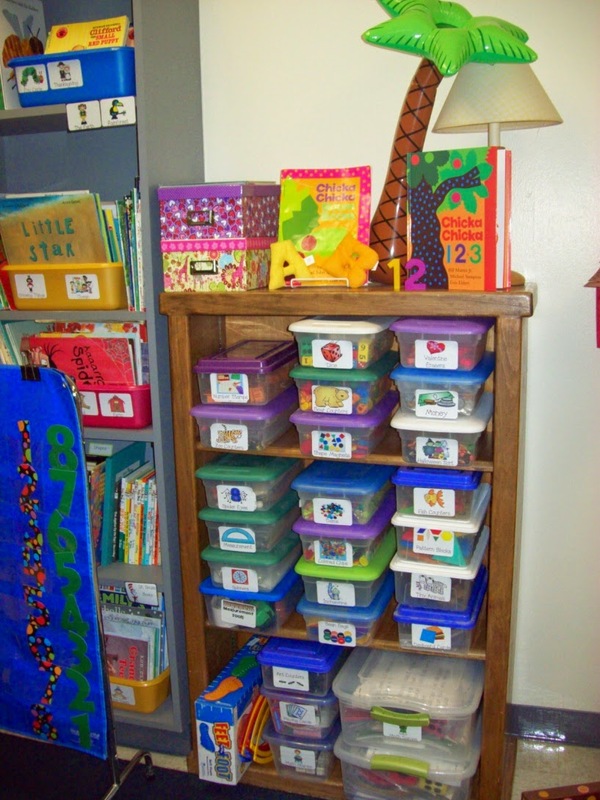 I used plastic tubs with lids to store all of my materials by theme and concept. I stored by books in a separate area, but also by theme and concept. Here is another great way to store your books and materials. This idea came from Mrs. Hoffer's Spot. She organizes her materials by month. The top bucket holds all of her "stuff" for that month and the bottom bucket holds the books that go with it. You can read the full post here. Use clear plastic containers and labels and store all of your materials separately. 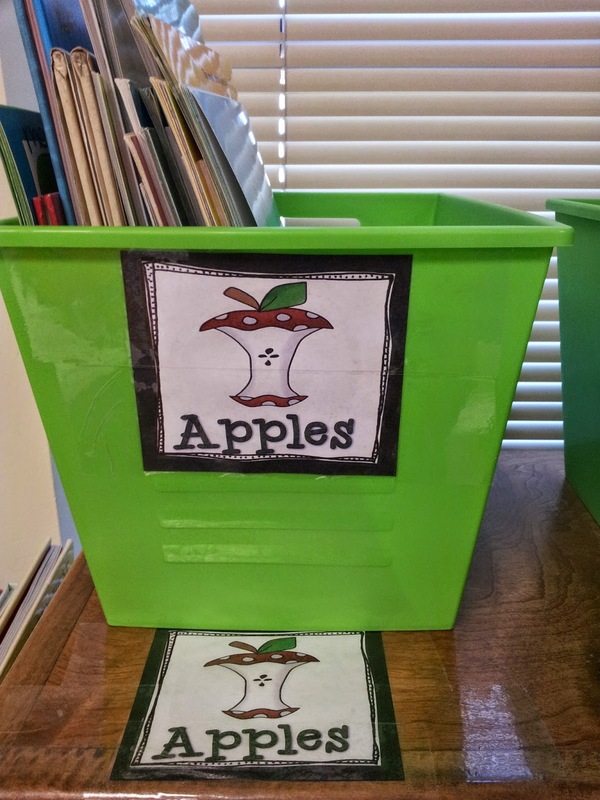 This idea came from The Clutter-Free Classroom. 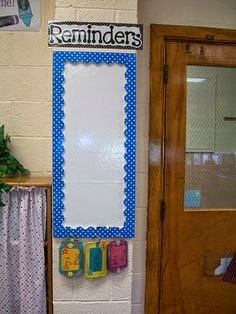 Hang a dry erase board or create a wipe-off space to record end of the day reminders such as changes in transportation. For more organizational tips and tricks and storage ideas, check out my Pinterest board Classroom Organization. 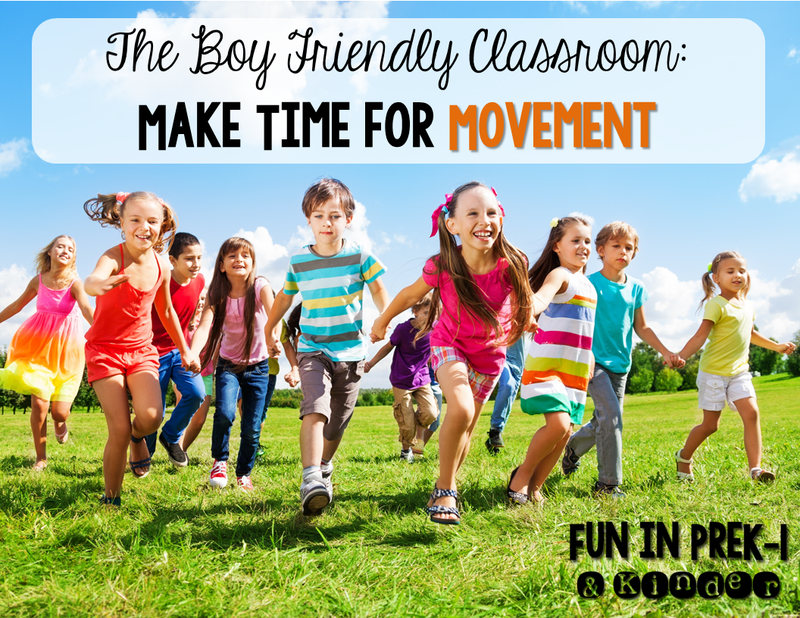 I found this quote from the blog post The Boy Friendly Classroom: Making Time for Movement and thought "Wow!" this picture sums it all up. If we do not provide our students with lessons that engage them and keep them moving and thinking then they will find other things to do... oftentimes things that disrupt instruction and learning. Novelty is key. Rotate techniques, strategies, and activities when students seem to be loosing focus or interest. When introducing procedures and routines never assume that students know everything. You will have to model the exact behaviors you want to see from your students. When teaching procedures and routines you have to scaffold your instruction. Model the procedure or routine you want them to learn. Practice it with them. 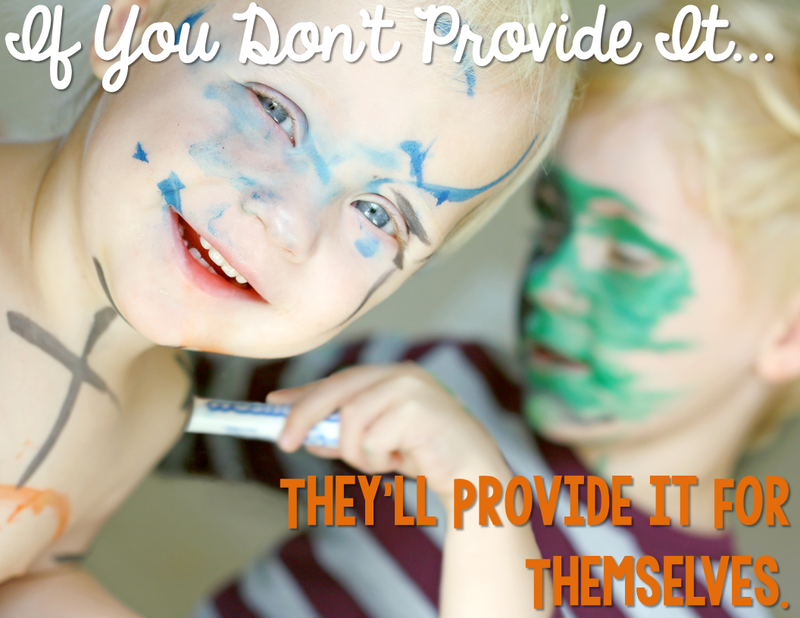 Have them practice on their own and with each other. Then slowly send them out on their own to do independently. Never assume that any procedure, routine, or task is so small or trivial that it does not require modeling and group practice. For example: You must model and practice how to enter the room, how to walk to the carpet, how to leave the carpet, how to line up, how to stand in line, how to work at each center, how to listen to a story, how to turn and talk to a partner, how to throw something away, how to get materials, how to go to the restroom, how to get a drink, etc. These pictures came from a Debbie Diller workshop. First, the teacher modeled, then the teacher had the students practice with partners. I Can... and anchor charts are another great way to scaffold teaching procedures and routines. Some routines and procedures take more modeling and practice than others. Don't allow yourself to be easily angered or frustrated by this. Keep practicing, recognize the correct behaviors, praise their efforts, and give lots of reminders. Do not give up or allow them to perform routines and procedures incorrectly because you are tired or frustrated by it all. This will not make things better, nor will it ease your anger and frustration at the end of the day when their is chaos and mess. Slow and steady wins the race... just keep practicing, praising, and reminding. They will get there. 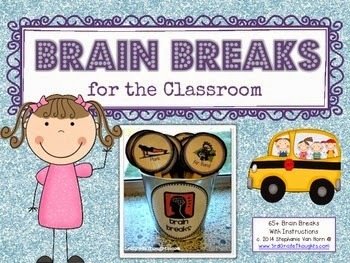 Break your direct instructional teaching time up with brain breaks and movement activities that are strategic, purposeful, and instructionally focused. Brain breaks are great for in-between activities. 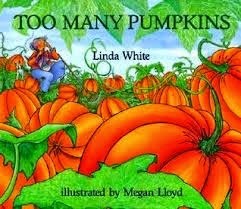 I used them in between read-alouds and lessons, or before we lined up, etc. 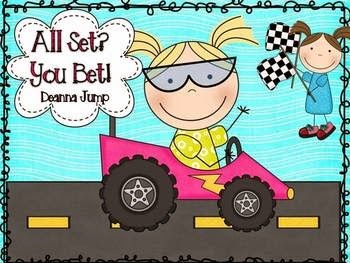 I used brain break ideas from Deanna Jump's All Set? You Bet? Classroom Management Transitions and Routines. 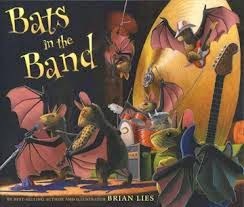 This unit also contains direct links to videos and songs that incorporate movement. You can find more movement videos and songs on my Pinterest board Music/Movement/Videos. I also used these from Third Grade Thoughts. Classroom cheers are another way to praise students and get them moving. I used these fun cheers with my students. 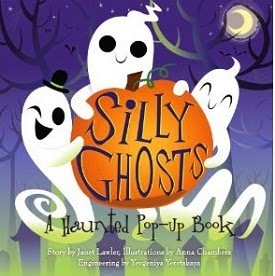 You can check them out on TPT here. Turn and Talk is another great strategy that allows students the opportunity to move. Transitions are another great time to get students moving. Check out this great post Transition Time...It's Like Hammer Time for the Classroom for some great transition activities. 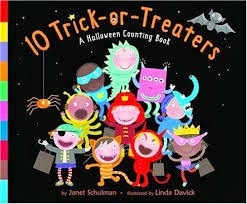 Some examples include counting down, singing songs, repeating pattern movements, and movement activities. 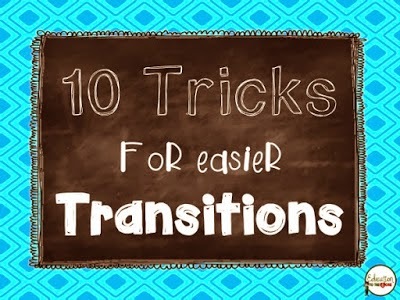 Education to the Core has some great tips for transitions too. When shhhhhhhhhhh doesn't work, use attention grabbers to bring students back from turn and talk, to get them quiet so one person can talk, or when they all start talking at once. I used these attention grabber cards. If you are interested in them, you can find them here. For more on the brain and ways to incorporate purposeful movement into your day, check out this post from Fun in PREK-1 & Kinder. This making time for movement reminder came from Jessica Fredrickson. You can get it for free here. One of Marzano's nine instructional strategies for effective teaching and learning is reinforcing effort and providing recognition. Effort and recognition speak highly to the attitudes and beliefs of students. Building relationships with your students contributes to better classroom behavior and creates a more learning-friendly classroom environment. Sometimes students need additional time to calm down or adjust to new activities. 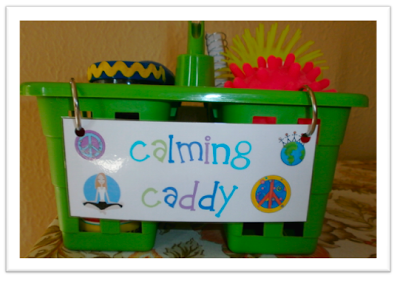 Crayons and Lesson Plans shared a great post about using a "calming caddy" with her students. Learn more about how she uses it and what she include in it here. 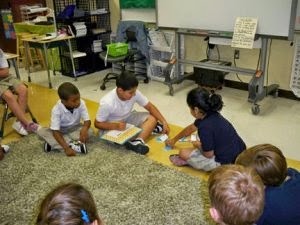 For students who are easily distracted, consider using a visual timer, novelty, giving the child a work space with a divider, using headphones, using tape to clearly define their space on the carpet, and allowing the student to stand up behind the class when they are seated on the carpet. Read more about these tips from Teach123 - tips for teaching elementary school here. Relationships make a difference in the way students perform in school. They can also make the steps needed in giving students what they need in the classroom a little easier. 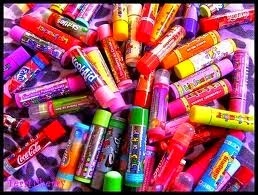 Rather than give out stickers or use a treasure box, I used incentives such as singing or moving to an extra song, rubbing "smellies" on their hands (flavored smelly chapstick), adding a pom-pom to their cup, classroom cheers and chants, and reward coupons such as work in your socks, bring a stuffed animal to school, sit in a special chair, etc. 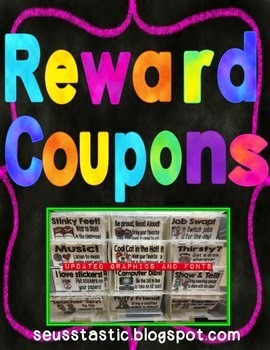 I used these great reward coupons from Mel D-Seusstastic.You can check them out in her TPT store here. This post merely skims the surface of classroom management and how to establish it in the classroom. 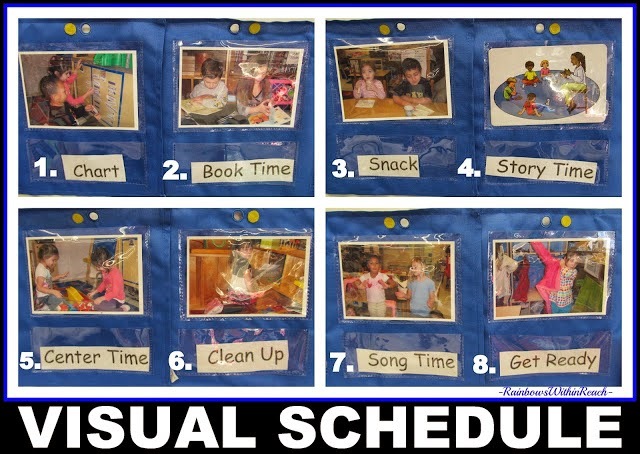 For more ideas and suggestions check out my Classroom Management Pinterest board. I am always pinning new ideas to it. I was in Barnes and Nobel tonight and it got me thinking about my favorite books to read in October. Here are some of my old favorites and a few new ones. 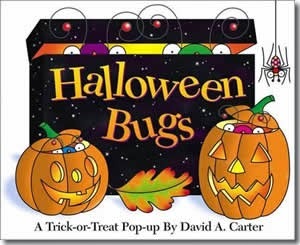 This David Carter pop-up bug book is one of my favorite in the series. 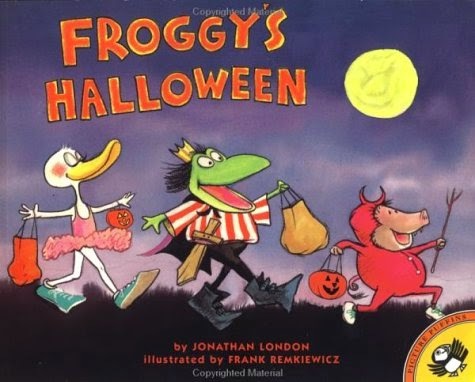 The bugs all use fun little familiar Halloween sayings. 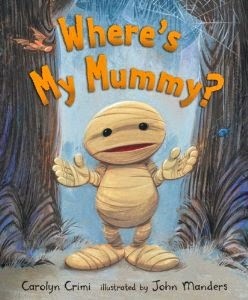 Any book by Todd Parr is a favorite. 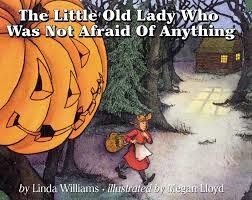 This book is a great springboard for talking about fears. As always, Parr writes about feelings and events that all little ones can relate to. My favorite example from the book is being scared when shopping for new underwear, but not being scared when wearing it on your head. I love the riddle pop-up books in this series. 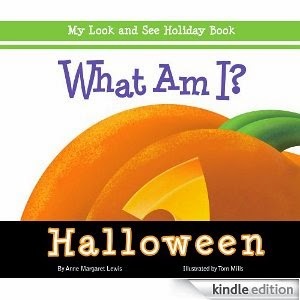 This one contains fun Halloween riddles. 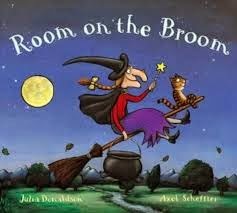 This story is so cute! 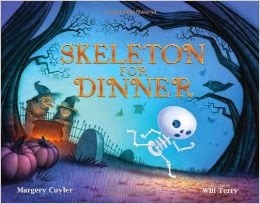 Skeleton finds the witches list of what's for dinner so he thinks the witches want to eat him. Silly Skeleton. The witches want to have you for dinner, not eat you. 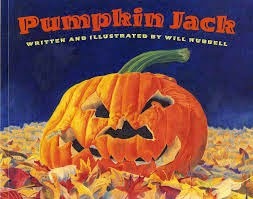 This book reminds me of the story A Turkey for Thanksgiving.